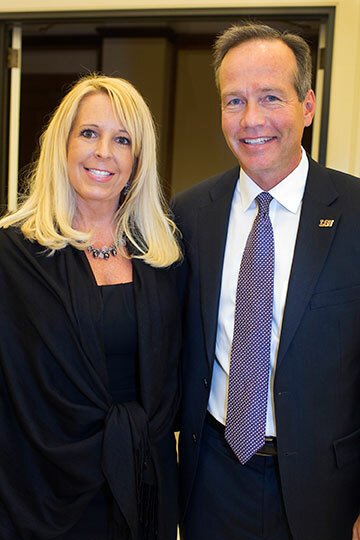 Dr. Alexander and his wife, Shenette, were welcomed to LSU in August 2013 at a reception co-hosted by the LSU Foundation, the LSU Alumni Association and the Tiger Athletic Foundation. Barely half a year into his LSU career, President and Chancellor Dr. F. King Alexander has proved (multiple times over) that he is exactly what LSU needs—and that funding for the university is a top priority. “Hi. Let me help you with that. You’ll love it here! Welcome home,” read the purple shirt he wore this year on LSU’s Move-in Day. He visited with families across campus while helping to tow their students’ belongings up flights of stairs in residential halls. In 2011, Alexander was selected by President Obama to serve on a domestic policy committee, providing counsel on higher education policy. As a participant, he emphasized the importance of institutional efficiency and effectiveness, re-enrolling college drop-outs, and redefining the term “land-grant university” for the 21st century. “We need a new federal and state partnership, like the initial one, that uses federal funding or incentives to reverse states’ disinvestment in higher education,” Alexander said. Since landing in Louisiana, he has leapt to meet students, alumni and donors, both locally and nationally, along with LSU chancellors, deans, directors and researchers. Alexander listens carefully to everyone he meets, responding to both praise and concerns for LSU. Fieldon King Alexander was born in Kentucky, was raised in north Florida, and bleeds purple and gold.